Firmly believing in the power of Bing, Microsoft is daring skeptics to compare its own search results against those of its arch nemesis, Google. 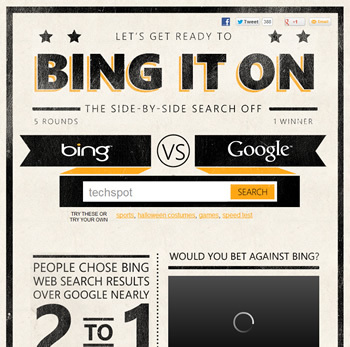 The company's "Bing it On" initiative provides a blind, side-by-side challenge between the rivals, selecting the winning search engine based on five user-performed searches. For each query, users are asked to select their favored results; however, they won't know which search engine produced them until the end of the test. Microsoft has been investing heavily in Bing, carving itself out a chunk of the search and advertising market -- a highly profitable arena which, unfortunately for Microsoft, remains overwhelmingly Google's domain. In fall 2011, we noted that Bing's operation was losing Microsoft nearly a billion dollars per quarter and a whopping $5 billion between 2009 and 2011. In the face of Google's empire, Microsoft has also made a number of bold moves to invigorate Bing: its deal with Yahoo, Facebook and Twitter integration, generous rewards and cashback programs and even utilizing its competitors search results to enhance its own. I would like to add that my own search-off concluded with Google winning 4 out of 5 results. I made several varied queries (e.g. answers to an obscure Windows XP problem, a good coffee grinder, a recent news item and so forth). The one query where Google did not win had been marked as a "draw" due to identical results. Although Bing is clearly a bad match for my own tastes, some readers may find it better suits their own needs. Microsoft is claiming that nearly twice as many people prefer Bing's results to Google. Feel free to take the test and let us know what you discover.